I think everyone is trying to figure out ways to stretch one’s dollar these days. We are also trying to learn how to go green. For those of us who are the crafty, artsy type we have to curb supply spending! In an effort to help myself I thought I would share my ideas with you as well. Dollar store has become my guilt free zone. I can spend less and buy more when I go shopping. First I make my wish list of craft supplies I need. I keep it in my wallet. This way if I am near a dollar “type” store at any time I can just pull out my list. The list will help keep you in check and this way hopefully to purchase only what you really need. Of course there is that one item that you simply must have, but I urge you not to buy it if you think it will sit in your studio for three years. (Speaking from experience). Below is a photo of things I needed that I purchased on my list. I will use all of these things for my creations and I did save some money. If you’re like me you love ephemera. This can easily put one in the poor house depending on how much of it you want or use in your work as well as how old and rare it is. My suggestion to you is to take some of the favorites you have and scan them into your computer. This provides unlimited access and editing options that you otherwise would not have been able to enjoy. Below are just a couple that I will be playing around with. Don’t be so fast to throw things out right away. If you honestly think you won’t use it then pass it on to another creative person or trade perhaps. All those mint tins and chocolate tins or cardboard chocolate boxes for every season, keep them around. Oh, and remember Grandma’s vintage cupcake individuals-you can do a lot of mixed media art on those. Below you will find examples of what to keep. Also, don’t be afraid to ask your friends and family if there is anything at their place of employment that they will be throwing out. You just never know. Look at this treasure trove my husband rescued from its untimely death march to the dumpster. I am so excited about creating from this bunch of goodies!! I will be creating little inexpensive kits for purchase from this as well. Stay tuned. 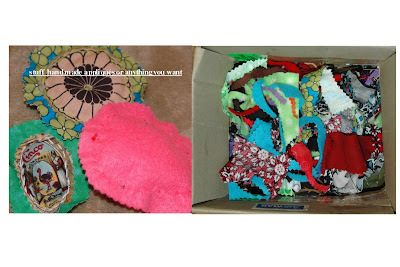 Save all those cuttings from when you're sewing so you can use them as stuffing for other projects. Broken jewelry and small ornaments or even little do dads that you find in the street can be saved for later projects. I try to organize mine so that when it comes time to create it gets used. These are just a couple of ideas for reducing, recycling or reusing. Thanks so much for reading, feel free to contact me, comment or a follow.